A samosa (/səˈmoʊsə/) or samoosa is a fried or baked pastry wi a savoury fillin, such as spiced tatties, ingans, peases, lentils, macaroni, noodles, an/or minced meat (lamb, beef or chicken). Pine nuts can also be added. 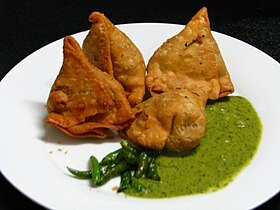 The samosa is claimed to have originated in Central Asia. ↑ "Samosa Connection". Samosa Connection. Retrieved 12 May 2015. ↑ "Did you know Samosa didn't originate in India?!". IBN Live. 17 August 2014. Retrieved 12 May 2015. This page wis last eeditit on 10 September 2017, at 03:28.